Private Label Dog Waste Bags Custom Printed with your own advertising message. purchased manufacturer direct, send a powerful advertising message to your customers and community. Selling community advertising on private label dog waste bags is a proven method that many communities and dog park care groups have used to eliminate the cost of the dog waste bags for their dog parks. Simply gather dog friendly advertisers in your community to be sponsors. The sponsors pay for the advertising on the dog waste bags. The custom printed private label dog waste bags are donated for dog park use. Rescue groups have also used this idea with great success! The rescue group designs a bag with the group’s logo and information. The bags are then sold to the members to raise funds for the group. A product that the dog owner regularly purchases becomes an income source for something they believe in. Great For Veterinarian and Animal Clinic Advertising! We have lowered the minimum for custom printed private label dog waste bags! Private label dog waste bags are now available in as few as 4000 bags! 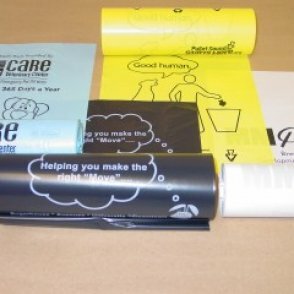 Creating a custom printed dog waste bag is easy. Decide the color for your bags. 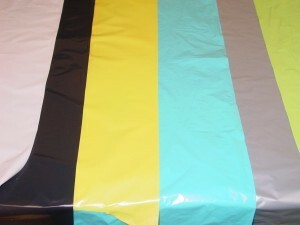 White, beige, black, yellow, medium blue and lime green bags are always available. In stock ink colors include white, black, and royal blue. Need a different bag or custom PMS ink color? We may be able to provide it, just ask. 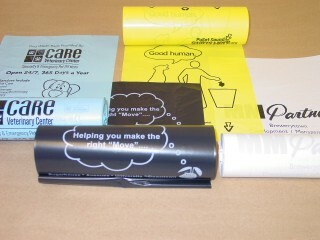 Custom printed dog waste bags are provided in rolls from 50-200 bags per roll. In addition to the printing plate, you have the cost of the dog waste bags…..